Thinking about the interaction between the Constitution and education reveals that they are deeply interconnected, at profound levels of interdependence and complexity. Those connections are often strikingly visible, but are sometimes quite subtle. But it is not only our political system that is dependent upon a viable and successful educational system. Our economic system also proclaims its reliance upon well-trained and educated workers. And our social system rests on two largely accepted goals that each require access to education--the “melting pot” which requires the successful absorption of diverse immigrant populations into a pluralistic social and cultural structure, and “upward mobility” which requires the permeability of class barriers. Both goals are achieved substantially through the education system. 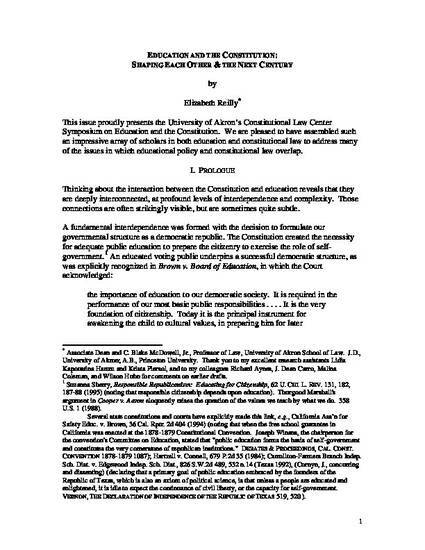 Elizabeth Reilly, Education and The Constitution: Shaping Each Other and the Next Century, 34 Akron Law Review 1 (2000).